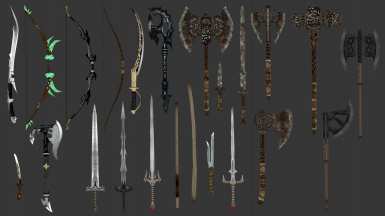 Do not redistribute any assets from my BSA file, all weapon mods used have different permissions for usage so don't ask me if you can use any for your wip instead follow the links in the credits. Big thanks to StrelokTesla for taking the time to make this video. NEW and some may also say ESSENTIAL, the IW Bashed Patch Fix is now ready to download. Created by Slangens, this file will correct overlooked bad edits (thanks to yours truly :P ) made in the last patch which caused problems with bashed patches. Overhauls and extends the entire weapons system by fully integrating hundreds of new weapons into the game, using many great mods and resources from the most talented authors on the nexus. 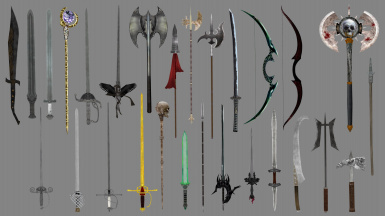 This mod also adds lots of off-hand variants to game to allow for duel-wielding. Off-Hand weapons are used as shields in this mod, but mods like Unnecessary Violence II can make them usable as duel-wield weapons. 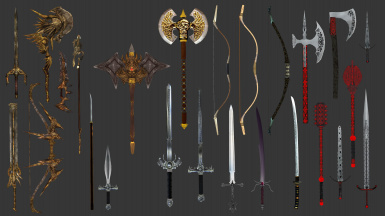 The aim of this project is to add a lot more variety when looting, purchasing, and battling enemies as everything appears by chance through the levelling system, you will also find halberds, polearms, spears, rapiers, and other weapon types. I made it this way because it's just my personal preference, most mods used were initially available to obtain from one location usually a store but I prefer to have new weapons appear by chance during exploration. 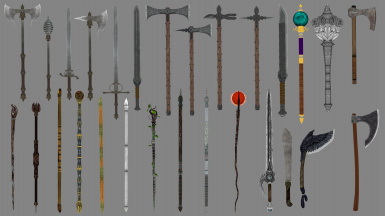 I have also made a few as unique weapons to the game which can be acquired by completing existing quests, for instance new deadric weapons for completing the shrine quests or becoming the arch-mage. Most weapons have been tweaked and balanced to avoid OP weapons and powers. I have also enhanced the levelled lists, so players can continue to find better weapons past the original cap. 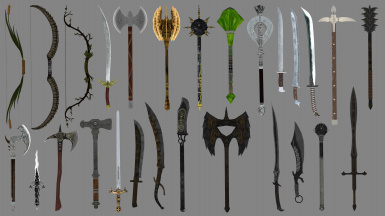 One good example is the addition of Ayleid weaponry that will start spawning after daedric level, also I have introduced 'grand' magic staffs with new models and stonger enchantments to find at high levels. And of course a great perk of this mod is that it merges lots of great weapon mods into one file to reduce your load order, using a single bsa to help the game run smoother. I have provided a few images to give you an idea of what invluded, however there are lots more which I will make a lists of ASAP. For now check the credits to get an idea. You may have noticed that I have even taken the liberty to provide a "Recommended by me.txt" file that lists other great weapon mods that would suit playing alongside this mod. I should point out that because this makes changes to a few vanilla quests and scripts, take care when making a patch as I hear this can cause issues so consider only merging levelled lists. Otherwise if you are happy with my levelled list edits simply overriding your other ones just make sure this mod loads last. 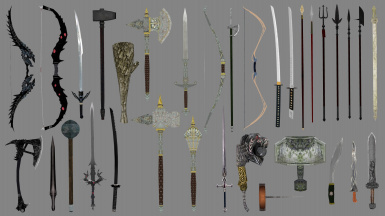 Disclaimer: All weapons included in this list have been included legitimately, with permissions readily given in the readme or personally granted by the authors themselves. Try to leave all feedback and questions in the page comments section. If you spot any bugs in-game please report them asap so I can get a fix worked out. I am always open to suggestions for improvement so feel free to post your ideas in the comments for my consideration.